A year after my stint as District Governor, I saw a PowerPoint presentation by a Lion named Claire M. Sullivan. I knew Claire from the Westport (Mass. 33-S) Lions Club. Her presentation was about a religious (Catholic) based organization in the Central American country of Honduras. 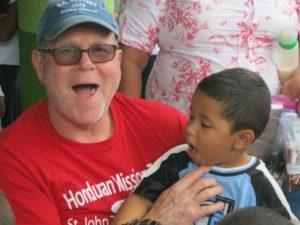 This organization is known as Olancho Aid and is based in the city of Juticulpa. Olancho is the Department (State) in Honduras where Juticulpa is situated. 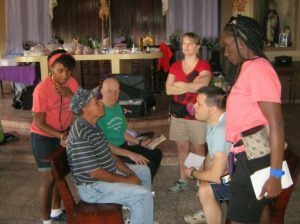 Her group is based out of St. John the Baptist church in Westport and travels once a year to Honduras. From there, the group with their nurses travel to outlying villages to provide some medical aid. 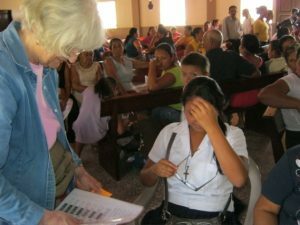 It caught my attention that the group also brings and distributes reading glasses and sunglasses. The District eye glass collection and sorting program was fairly new at that time. I asked Claire if there would be room for another person and if I could help with the glasses. 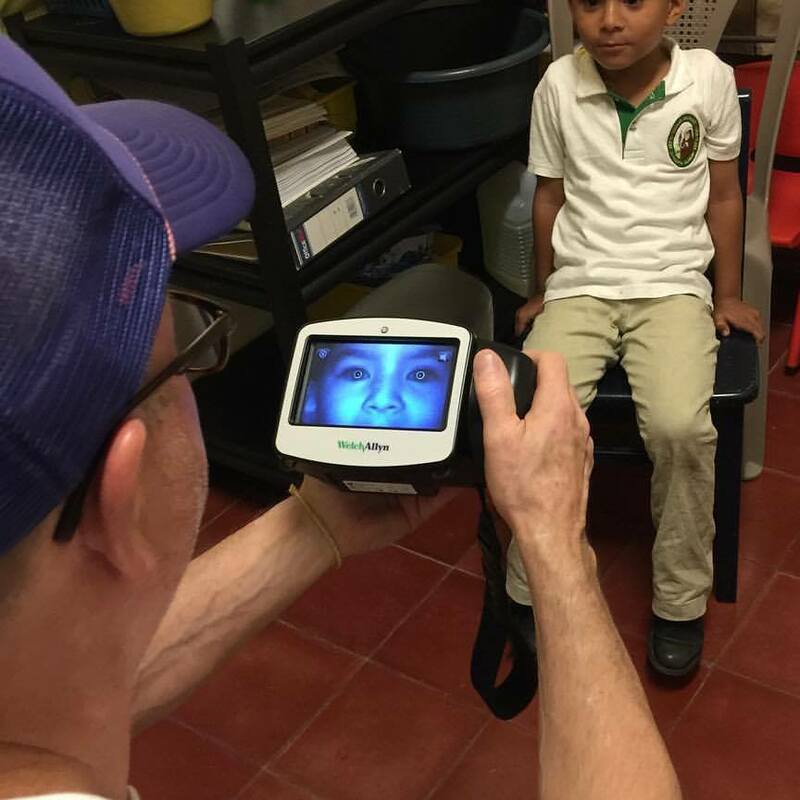 We have since brought hundreds of eye glasses from those collected in District 33-S.
Olancho Aid supports a number of religious based English immersion schools from pre-school through university. The following year while attending the USA/Canada Forum in Tampa, Fla., I was speaking with the owner of a vision testing company named Plus-Optix. I explained to her how I had gone to Honduras that year, about the schools there and how one day I would like to test the students there for vision problems. She asked when I would be going next and offered me the free use of one of their machines. This was like our Spot Camera but didn’t test as extensively as ours as it was of an earlier generation. It was also quite bulky but very usable. I screened over 800 children that year and had about a 10% referral rate. Through moneys donated from the Westport, South Attleboro, and South Attleboro Village Lions Clubs (33-S), many of those students received glasses. 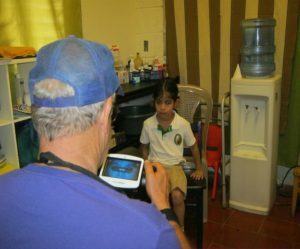 Today, some five years later, I and my colleague Lion Jesse Armell also from South Attleboro Lions Club, have screened another 500 students in the mission schools using the Spot Camera. In addition, this year we also tested all the students in the special needs school. We saw quite a few students in fifth and sixth grades who already had glasses. I had to wonder if they first got them because of that initial screening five years ago. Because our Welsh Allyn Spot Camera is battery powered and rechargeable, I have been able to go out to some of the outlying villages with the rest of the team when not at the mission schools. I was able to screen an additional 300 people there. Surprisingly, the eye health in those villages seems better than in the city with few children testing poorly. Simpler diet perhaps. Life here is simple. The people are very poor but happy nonetheless. They are always very warm and welcoming to us. We also found the local Lions Club to be active in the community supplying local school children with school uniforms and back packs. Children are not allowed to attend school without these items. 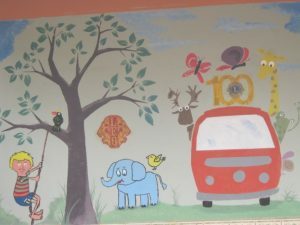 Below is a photo of the mural that was painted on the wall of the orphanage in town. Thank you to the Eye Mobile Committee for allowing me to take the spot camera this year and giving me the opportunity to serve. PS When Lion Jesse was not testing eyes, he was teaching kids how to brush their teeth.